Everything is beginning to accelerate on the Canadian Prairie. Summer swings into autumn swiftly, and this year seems particularly quick. 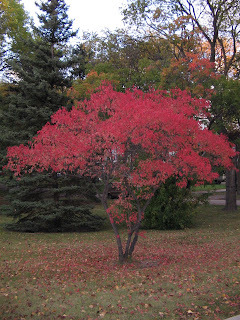 The photo above is a neighbour's tree, an Amur Maple I think. It turns the most stunning shade of red/pink/orange. These tomatoes were harvested from my tiny garden just two weeks ago, and now the leaves are already turning on the trees, unbelievable. Combine first four ingredients and pour over tomatoes. Let sit at room temperature for half an hour, so flavours can mingle. This recipe is very yummy, and basic too. Summer garden tomatoes are best left fairly simple I think. I've finally completed that first sleeve on the Tangled Yoke Cardigan. In a continuation of the mental block I'm having with this project, I knit too far, by about two inches, in fact. 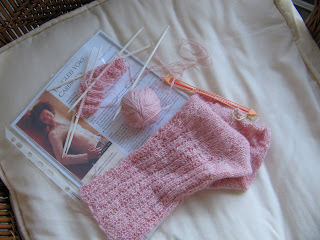 However, I knit back and started the next sleeve. Hooray!